She could go all the way!! Please take a moment to help my friend, Amanda, one more time. She is almost there! We have already had her up to 2nd, but she has fallen to 4th recently. A Playstation and some board game are ahead of her right now, and her posting is by far the coolest, most honest, and not commercial one there. She is an undergraduate student with an interest in paleontology and is in this competition to help her pay for her education. As Julia noted, the competition runs through Valentines Day. If you are clicking though my blog, you can vote every 4 hours. However, if you vote directly from your blog feed it will count as another site, and that will help her. So please vote vote vote and spread the word! Another fossil related song that just came out - "Fossil Contender" by the Gourds. This is a band that I remember playing in town when I was an undergrad at the University of Arkansas. This song is on their new album Haymaker! Listen to it here. And you know what I was told? I want to make a CD someday of all paleo related songs. Can anyone out there think of any others? Alright Geoblogosphere, I have a challenge for you: any idea what this is?! Only info I have for you is it is from central Tennessee (Ordovician). The only thought we have had so far is maybe(??) Cruziana??? The first in a monthly series of articles celebrating 100 Years of Discovery at Dinosaur National Monument was published last week by Dinosaur National Monument Park Guide Matthew Greuel. Keep an eye out on the Vernal Express for future articles. "Earl Douglass came to the Uinta Basin not to study dinosaurs but fossil mammals. He found much more than that, both paleontologically and otherwise. Earl Douglass’ path to the Uinta Basin is not unlike many people today: The more he studied his trade, the science of studying fossils called paleontology, the more he knew there were fantastic opportunities for his line of work. His years of researching, studying and collecting in fossil beds in Wyoming and Western Montana in the late 1800s earned him praise in the field of paleontology, but he continued to toil in relative obscurity in the eyes of the public. He focused his research on fossil mammals – camels, three-toed horses, rhinoceroses, mastodons and others. He added 17 genera and 83 species to the scientific record of fossil vertebrates before coming to the basin. Photos of Earl Douglass can be found in the Special Collections department of the University of Utah, Marriott Library Earl Douglass Photography Collection. "The French Academy of Sciences turns down the membership application of Nobel Prize winner Marie Curie." Because she is a chick (and because she was Polish and not Catholic enough). Read about it here. Thanks to Laura for the heads up. Article at Wired.com by Tony Long. Who would have thought you would need to protect your blogs content. But I guess these days you can never be sure. I had a surprise earlier this week when I found out that someone had taken one of my blog post, turned it into a PDF, and was distributing it. The only credit he gave was a link to the post. This all confused me greatly since this is a public blog and anyone can read the post. After speaking with this person I found that he was just trying to share some information I had posted here, which I appreciate. I think that one of the reasons I blog is to tell people about things I find interesting and about things they should be aware of (in my opinion). If you are interested in protecting your work with a Creative Commons License, just swing by this webpage [link], fill out a short form answering a few questions, and the code is given to you to post on your blog or website. There is a great blog post over on Lost Art of Blogging where I found all of this information (and more!). I encourage anyone who is interested in protecting their blog to take a moment to read it. Lorelle at WordPress also has a great article on this topic. I would really appreciate thoughts on this topic from the blogosphere. Is this something you would consider doing? Why or why not? As reported earlier*, Nate Murphy has been accused of stealing fossils from private land in Montana. Charges have officially been brought against Mr. Murphy for the theft of a small theropod skeleton. The New York Times reported today that Mr. Murphy has in fact been charged with felony theft after a year long investigation. The story begins in 2002 during an excavation in Montana, where Australian geologist, Mark Thompson, was a participant. He discovered the remains of a small theropod with Mr. Murphy, who is reported as asking Mr. Thompson to not report the find to Joann and Howard Hammond, with whom Murphy had a profit-sharing arrangement to excavate on their land. Mr. Murphy claims that he did not know the land he was working on did not belong to the Hammond family, but rather was leased from Bruce Bruckner, making the agreement with the Hammond’s void for the land where the fossils were found. Mr. Thompson did not tell the Hammonds about his discovery, but did show pictures and fossil remains taken from the site to paleontologist Robert Bakker. In 2006 when Mr. Murphy took a specimen of a fossil turtle to the Dinosaur Field Station (now the Great Plains Museum) he told colleagues he found it near Saco, Montana (25 miles away). According to Murphy, it was not until later he discovered the remains of the small theropod under the turtle specimen, which he called “Sid Vicious.” Thompson contacted the Hammonds in 2007 when he heard about the discovery of “Sid Vicious.” The Hammonds contacted Mr. Bruckner, who them filled a complaint. Later, Mr. Murphy admitted to finding the fossil (fossils?) on Mr. Bruckner’s land and that he made a mistake in assuming he was on land he had an agreement to work on. Now Murphy is facing felony theft charges, to which he says he “has no choice but to plead guilty to…” A trial is set for March. *Read some of the comments on the previous blog post as they are interesting and tell more of the story. The links are in the first sentence of this post. The New York Times article is behind a registration wall, but can be read once registration is completed (and it is free). The above is paraphrased from Jim Robbins' New York Times article "Instead of Glory, the Finder of a Rare Dinosaur Fossil Faces Charges of Theft" and credit should be given to him for the reporting of this update. Thanks to the multiple people who brought this update in the story to my attention. Habaib, M.B. Comparative evidence for quadrupedal launch in pterosaurs. p161-168. Elgin, R.E., Grau, C.A., Palmer, C., Hone, D.W.E., Greenwell, D., & Benton, M.J. Aerodynamic characters of the cranial crest in Pteranodon. p169-176. Martill, D.M., & Witton, M.P. Catastrophic failure in a pterosaur skull from the Cretaceous Santana Formation of Brazil. p177-185. Lockley, M., Harris, J.D., & Mirchell, L. A golobal overview of pterosaur ichnology: tracksite distribution in space and time. p187-198. This meeting is being convened by Grand Staircase-Escalante National Monument and partners to celebrate the 10th Anniversary of the Kaiparowits Basin Project, a collaborative effort focused on researching all aspects of the Late Cretaceous geology and paleontology of south-central Utah. The conference’s vision is to provide an opportunity for the Late Cretaceous research community and the public to exchange ideas and present findings of recent work in the Western Interior of North America. Utah themed papers presented will be considered for inclusion in a compendium volume on southern Utah’s Late Cretaceous Geology and Paleontology expected to be published in late 2010 by Indiana University Press. Abstracts are due by 5:00 pm MST February 2nd. For schedules, registration, hotel information and to submit an abstract, please see the website. The meeting follows the 8th Conference on Fossil Resources, May, 19-21, also to be held at the Dixie Center. For information on this meeting, please see their website. Thanks to Kay for the heads up. I guess I do not own enough comic books and sci-fi tv series on dvd to do well in the dork category. Several years ago my friend Dave Lovelace commissioned Russel Hawley (of the Tate Museum in Casper, Wyoming) to draft up their field creed for t-shirts, and the above image was the result. Dave suggested I use the image in my cafepress store, and I thought it was pretty funny so I have added it to several items there. On a similar note, the Second Annual Fossil Preparation and Collections Symposium will be held this year at the Tate Museum on Friday, June 5th (2009). The first conference, held at Petrified Forest, Arizona in 2008, was a great success! "The symposium is devoted 100% to preparation, field techniques and collections care and management. A great opportunity to learn, teach, and enjoy our profession!" The combination of field trips, workshops and presented papers was a nice format and one familiar to many of us. They are also now looking for presenters, so if you have a neat idea of something preparation or collections related think about sending in an abstract for a talk! For additional info, contact JP Cavigelli, the Tate Geological Museum, the facebook page for the meeting, or post your questions to the SVP PREPLIST. 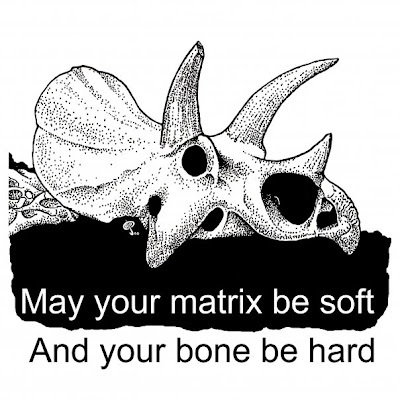 The wonderful Richard Butler was nice enough to make a PDF of the Nedoceratops paper discussed in my last post. 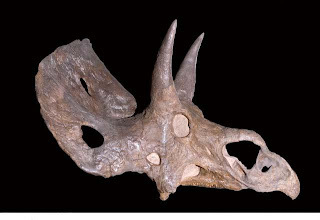 As mentioned in the comment section of the last post, the etymology of the new name Nedoceratops is "nedo" the Russian prefix for insufficiency with the generic name Ceratops. I, personally, think that naming a creature as insufficient is not very nice. There are plenty of fossils out there named on the basis of only the skull, so why is this particular one so insufficient?! If it is so insufficient why not let someone who is interested in the poor creature work on it. The name had been out there for 102 years! 102! What was wrong with letting it remain until someone who is interested in it work on it rather than just giving it a sad, rude (in my opinion) name? I think Diceratus (Greek di ‘‘two,’’ Greek ceratos ‘‘horned’’), was a far better name in comparison. But that is just my opinion. Edit: I asked Dr. Ukrainsky in an email what he meant by "Nedo" and this was his response: "Russian prefix "nedo" (insufficiency sensu lato) means, that this ceratopsian has lack: nasal horn absent." Ukrainsky, A. S. 2007. A Replacement Name for Diceratops Lull, 1905 (Reptilia: Ornithischia: Ceratopidae). Zoosystematica Rossica 16(2): 292. Another twist in the name change of Diceratops (see my previous post on this). The ceratopsian name 'Diceratops' (Lull, 1905) was preoccupied by a member of the Hymenoptera insects. In early 2008 Octavio Mateus published a name change in the genus of the ceratopsian Diceratops to Diceratus. A paper was brought to my attention today, in which a Russian researcher, Andrey Ukrainsky, claims that two names, Diceratus Mateus (March 1, 2008) and Nedoceratops Ukrainsky (December 20, 2007), were independently proposed for Diceratops. Due to the principle of priority, Ukrainsky is claiming the priority for Nedoceratops (Ukrainsky 2009). I have not been able to get a copy of the 2007 Ukrainsky paper at this time (I have written and asked for a copy), but in his 2009 paper he acknowledges I. M. Kerzhner for the immediate publication of his 2007 paper. The 2008 Mateus paper was accepted on May 29, 2007. It appears that this is another case of nomenclatural coincidence where the two authors were working on the same thing at the same time with out and knowledge of what the other was doing. The journal where Ukrainsky published his 2007 paper, Zoosystematica Rossica, does exist, but for some reason has not updated their website in quite some time, so I can not confirm the publication of the paper on their website. That seems odd. It is too bad that Ukrainsky did not choose to publish this paper in a more high profile journal (no offense to Ukrainsky or Zoosys. Ross, but I had never heard of the journal until today) and/or publicize and bring attention to this change. Thanks to those who have already spoken with me about this. What are the other thoughts out there regarding this? Lull, R. 1905. Restoration of the horned dinosaur Diceratops. American Journal of Science, 20: 420–422. Ukrainsky, A. S. 2009. Synonymy of the Genera Nedoceratops Ukrainsky, 2007 and Diceratus Mateus, 2008 (Reptilia: Ornithischia: Ceratopidae). Paleontological Journal 43(1): 116. 60 Minutes aired an interesting piece the other night talking about how this past years high oil prices were not the result of "Supply and demand" as everyone was being told, but rather the result of financial speculation from Wall Street. I thought I would post the video here in case you might have missed it. AAPG has a list of their grants available posted online for those students who are looking for aid! There are even two grants, the Raymond C. Moore Memorial Grant and the David Worthington Family Named Grant, which are specifically for students with paleontology research. You can find out all the information you need to know here, and can even apply online. Remember, all applications must be completed online by 11:59pm (PST) on January 31, 2009. Thanks to Jerry for the heads up on these grants! A friend of mine, Meredith Wolff, and her sister Robin, have created a fun business of creating hand-made shadow puppets (Orange Moon Toys). They have many different lines, including four varieties of Prehistoric shadow puppets. Meredith is a very talented artist, who has done a fair bit of scientific illustrations also. These puppets are a great idea for kids and adults. They have a great collection, including other cool things such as the undead, creepy critters and arctic circle life (no, not the type you find in the fast food restaurant - although I guess the creepy critters might be in the kitchen...), sea life (including everything from whales to 20,000 leagues under the sea), people and history (including Obama & McCain), stories and legends (including their very cool new Thai series! ), and seasonal varieties. If playing with shadow puppets is not your thing, think of all the other cool things you could do with these, like putting them on the inside of a lamp shade or light fixture to snaz up your plain fixture and create a neat art piece. Check out their blog and then swing by their store to pick out your own set of puppets! 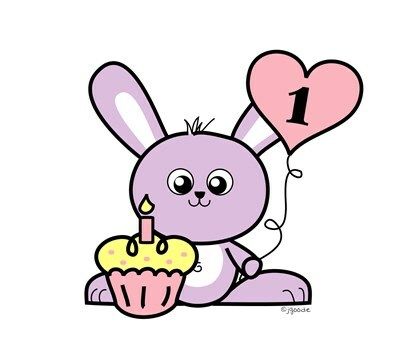 Today is Dinochick Blog's 1 year anniversary! It has been a great (and crazy) year. I appreciate all of you for continuing to read. If I didn't know you were out there I might not be here still, so thanks! Here's to another great year, with hopefully many great stories to come and far less drama! Chris over at Highly Allochthonous pointed out a list of GeoBlogs (including many PaleoBlogs) that are out there today - far more than there were this time last year, which is awesome. Be sure to check it out (and Chris' post on the original subject and the need/want for geotags). The folks over at Disney World asked me to pass this along. It sounds like a pretty neat restaurant (although I am not sure why there is a T. rex in the ice age [plug for the newest Ice Age movie maybe, but its not a Disney movie I do not think], but hey, its a restaurant). This restaurant is located in the Downtown Disney area of Disney World (the shopping, dining and entertainment district). "T-Rex: A Prehistoric Family Adventure" seats 600 and features both animatronic dinosaurs and a real 4500-gallon saltwater aquarium! They have all sorts of Paleo-themed menu items, a gift shop (or course) and a place outside where the kiddos can "dig" for "bones." So the next time you are in Florida, you may want to swing by and check this place out! I thought I would compile a list of all the neoceratopsian related publications (papers and abstracts) from this past year. Hopefully I did not miss anything, but if you know of one I might have missed, please let me know (Update: see the comment below for those that I did miss). Tereschenko, V.S. 2008. Adaptive features of protoceratopoids (Ornithischia, Neoceratopsia). Paleontological Journal 42(3): 273-286. Farke, A. 2008. Evolution and function of the supracranial sinuses in ceratopsid dinosaurs and the frontal sinuses in bovid mammals. Journal of Vertebrate Paleontology, 28(Suppl. to 3): 76A. Andy talks a little bit about this on his blog. Keenan, S. 2008. Taphonomy of a Triceratops bonebed from the Upper Hell Creek Formation, Garfield County, Montana. Journal of Vertebrate Paleontology, 28(Suppl. to 3): 99A. A poster at SVP discussing the second known Triceratops bonebed, preserving a minimum of three individuals. Mallon, J., Holmes, R., Anderson, J., Farke, A, and Ryan, M. 2008. New information on two chasmosaurine ceratopsids from the Horseshoe Canyon Formation (Late Cretaceous) of Alberta, Canada. Journal of Vertebrate Paleontology, 28(Suppl. to 3): 111A. Another poster from SVP discussing undescribed cranial material attributed to Anchiceratops and Arrhinoceratops. I look forward to a publication on this one! Miyashita, T. 2008. Two previously undescribed skeletons of Leptoceratops (Ornithischia, Neoceratopsia) from the latest Cretaceous of southern Alberta. Journal of Vertebrate Paleontology, 28(Suppl. to 3): 117A. Articulated postcrania from the Willow Creek Formation and an associated skull and postcrania from the Scollard Formation are now added to the list of Leptoceratops specimens. Roberts, E.M., Tapanila, L., Mijal, B. 2008 Taphonomy and sedimentology of storm-generated continental shell beds; a case example from the Cretaceous Western Interior Basin. Journal of Geology, 116(5): 462-479. The shell bed taphonomy is associated with a ceratopsian quarry from the Kaiparowits Formation in southern Utah. Tanoue, K., You, H., and Dodson, P. 2008. Comparative morphology of basal ceratopsian dentition. Journal of Vertebrate Paleontology, 28(Suppl. to 3): 151A. Tumarkin-Deratzian, A. 2008. Long bone surface textures as ontogenetic markers in centrosaurine ceratopsids. Journal of Vertebrate Paleontology, 28(Suppl. to 3): 154A. Yeaa! Another postcrania poster! Is there a textural change in long bones that can help assess increasing size/age classes, and is it consistent across taxa? Looking forward to a paper on this one as well. Varriale, F. 2008. Dental microwear and jaw mechanics in basal Neoceratopsians. Journal of Vertebrate Paleontology, 28(Suppl. to 3): 156A. Alifanov, V.R. 2008. The tiny horned dinosaur Gobiceratops minutus gen. et sp. nov. (Bagaceratopidae, Neoceratopsia) from the Upper Cretaceous of Mongolia. Paleontological Journal 42 (6): 621-633. Fricke, H.C. and Pearson, D.A. 2008. Stable isotope evidence for changes in dietary niche partitioning among hadrosaurian and ceratopsian dinosaurs of the Hell Creek Formation, North Dakota. Paleobiology 34(4): 534-552. I have not gotten a copy of this one yet, I'll have to get back to you. Look forward to a FLOOD of new ceratopsian papers next year with the publication of a new book, the results of 2007's Ceratopsian Symposium that was held at the Royal Tyrrell Museum (September 22-23, 2007). You can still see a list of the talks from that meeting here. Something to look forward too! !